Probably the last thing the ukulele world needs now is another songsheet for Raindrops Keep Falling On My Head. But that’s what it’s going to get! This isn’t in any way an attempt to say that all the others are rubbish and that this is definitive or better. It’s just that when I was looking around I couldn’t find one that (a) was clear, (b) sounded right, and (c) was complete. So this sheet is an amalgam of a number of sources (particular this one), and gives me a version that I’m happy with. This is a song from the awesome songwriting team of Burt Bacharach and Hal David. During the 1960s and 70s they were responsible for a slew of sophisticated classic pop songs – songs such as I Say A Little Prayer, Walk On By, Close To You, The Look Of Love, Do You Know The Way To San Jose, Anyone Who Had A Heart, Alfie, Always Something There To Remind Me. The list is endless. 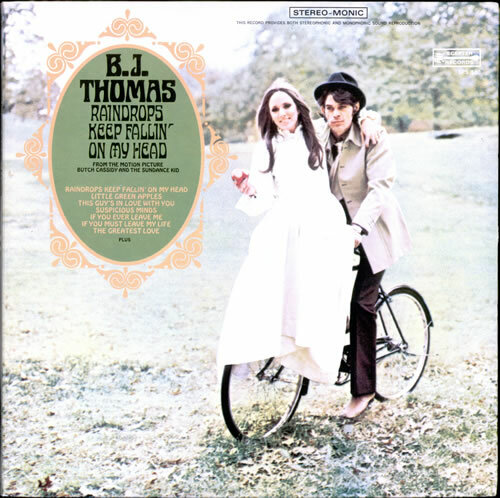 “Raindrops” was famously included in the film “Butch Cassidy and the Sundance Kid” in a beautiful dreamy scene involving a bicycle. Recorded by BJ Thomas, the song deservedly won an Oscar for best original song, and has gone on to be covered numerous times since. So here’s the songsheet. It’s just chords and lyrics, which follow the BJ Thomas recording. As with all Bacharach songs, the timing is sometimes a little tricky, so you’ll need to play around with that and get the feel of it from the original recording. Note that I didn’t bother to include the instrumental outro section of the song, which is lovely but (a) a little tricky and (b) not ideally suited to solo uke! Enjoy! P.S. If you want something a bit more challenging, there’s a great instrumental tab version of the song here, along with demo video. Well worth giving a go. Categories: Pop | Tags: 1960s, 1969, Bacharach, Pop, ukulele | Permalink. It seems I’ve been doing this little blog for just over a year now. The very first song I posted was a slightly obscure New Order b-side (1963) and I promised at the time that I’d publish the slightly better known a-side at some point as well. So, it’s been a little while coming, but here it is. True Faith is probably New Order at their pop-iest, and certainly was something of a commercial peak for the band. Produced by Stephen Hague, at the time on a roll with the early success of Pet Shop Boys, the song is a further move towards dance-oriented songs. From the opening clatter of electronic drums the recording is a full on, wall-of-sound type production, which contrasts with the slightly fragile vocals of Bernard Sumner. But if anything the song is best remembered for the surreal video that accompanied it. The songsheet is quite straightforward. The key is getting a good steady strumming pattern behind it. I prefer something which mirrors the rhythm of the original, which is a little difficult to describe (something like ddddu-ud-dudu) but is best worked out playing along to the origianl (the song sheet is in the same key). Enjoy! Categories: Post-Punk, Synthpop | Tags: 1980s, 1987, New Order, Post-Punk, Rock, Synthpop, ukulele | Permalink. I was listening to my iPod on shuffle the other day, and suddenly this little ditty popped up. And I thought – you know what, that would make a great little ukulele song. And I think I was right! Eels are not a band I really claim to know well. 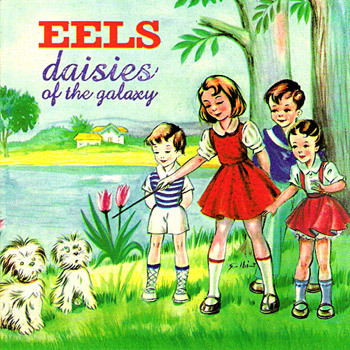 I only know one of their albums, Daisies of the Galaxy, from which this song is taken. They are essentially the brainchild of Mark Oliver Everett, better known as “E”, who is the son of famous physicist Hugh Everett III. Everett is a fascinating and thoughtful character, something that shines through in his songwriting which, whilst it certainly does touch on some of the staple subjects of rock and pop music, does so from a a uniquely oblique perspective. I Like Birds is typical of that quirkiness, and combines that with a stripped-back winsomeness that always made this a stand-out track for me. A simple, repeated strummed guitar pattern, with little adornment, I’m sure that there is some deeper psychological intent behind this song (I came across this description, which cites it as being about his recently deceased mother, who loved watching birds, with the song being an attempt to stay connected to her). But the song works fine for me as a reflection on the simple pleasures and life of a bird, contrasted with the absurdities and complications of modern life. As an aside, Everett’s autobiography, “Things The Grandchildren Should Know“, is a great read even if you’re not familiar with the band and its music. And so here’s the songsheet. Nothing complicated – it’s a simple song, as I’ve said. Once you’ve got the strumming rhythm figured out (just listen to the song) you’re almost there. But you do have to get the pauses and the “knock, knock” at the end of each verse – that’s what makes it! Note that this songsheet is in the key of C, because I find it easier to sing in that key. If you want to play along with the original, that is in E, so instead of C / Bb / F you would play E / D / A. Enjoy! Categories: Indie | Tags: 2000, 2000s, Eels, Indie, ukulele | Permalink.